Bands like Silent Force sure put a lot of pressure on the listener. On the one hand, the music that's found on their second release "Infatuator" offers nothing that hasn't been heard many times before. It is absolutely typical of the European power metal movement that has come to glut the record racks recently. The music is full of all the expected clichés such as classical guitar arpeggios, soaring "heroic" chorus lines, medieval imagery and the aping of bands like Judas Priest, Helloween and Hammerfall (who arguably started this whole modern power metal movement). 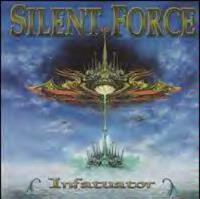 Silent Force is certainly one of this horde of bands. The trouble is, they are so damn good at what they do, you are forced to play air guitar and bang your head with them no matter how typical their sound is. The head says they are old hat but the heart says, rock on, warriors of metal! Musicianship is most definitely a strong point here. The group's lead vocalist is none other than D. C. Cooper, the celebrated singer of Royal Hunt. Here, D. C. applies his mega-lungpower to a decidedly harder and heavier vibe than the more melodic Royal Hunt. He does a splendid job and it's easy to understand why he was in the running for Rob Halford's spot in Judas Priest. The other members, particularly ex-Primal Fear guitarist Alex Beyrodt, also excel. Make no mistake, if you are a fan of the current European power metal scene, "Infatuator" won't be leaving your stereo any time too soon. I would still like the band to apply just a little originality to their sound, but Silent Force have mastered their genre. For now, the heart wins out over the head! The title track shows the band's worship of Judas Priest with no apologies given. D.C.'s opening scream is right out of the Halford textbook and the track is a fast-paced burner with killer guitar soloing from Alex Beyrodt. One of the record's best tracks, this is another quickly paced headbanger, that finds Cooper singing in a pleasing lower register. The chorus melody is wonderful and makes for a most memorable metal tune. The keyboards of Torsten Rohre play a more important part here and the song is complex and fairly progressive, reminding me of prime Queensryche. Though more melodic, it's not lacking in heaviness. This is as corny as the title suggests. I found it to be cliched, "happy" power-metal typical of the bands running around Europe these days. The chorus is pretty sappy on this one. In some ways, this is as cliched as "Promised Land" but it's an all-around better track. It's got a real Hammerfall type feel to it, especially with that huge, catchy chorus. If there was any doubt Silent Force is influenced by Judas Priest, it should be put to rest by this faithful cover of the "Painkiller" tune. Cooper wisely doesn't try to out-scream Halford, and the cover benefits by not being the usual choice. A brief instrumental introduction to the next two tunes, this sounds like an excerpt from some historical film. This sizzling speed metal track is probably the best all around song on the record. It's got a cool "bouncing" vocal line on the verse and never lets up on the throttle from the get-go. The spoken dialogue in the middle is a little bit too much but this one shows SF at their most aggressive. A sequel to the previous track, this comes belting out of the gate in the same powerful fashion, with plenty of speedy picking. However, as the track goes on, it slows down quite a bit and allows for some more melodic keyboard work before finally returning to raging metal. This is one of my favorite songs. It's not fast at all, but has a very regal and mysterious feel to it, echoed by the lyrics. Anybody who has heard the cult power metal band Vicious Rumors will recognize the vibe they're trying to create here, and Cooper's vocals are once again outstanding. I detected a really strong Deep Purple feel on this song, mostly due to the very Jon Lord-ish feel to the keyboard work. There's a strong riff full of that classic Hammond B-3 organ sound, and the unusual chorus is also a little reminiscent of Purple. I grew to like this one after a few listens. Well, as the title might suggest, here is the sappy piano ballad that is de rigeur for all power metal albums. There's some good vocal interplay between Cooper and a fine female vocalist, but this is pretty insipid stuff, reminiscent of Journey at their worst and a real flashback to 80's hair metal balladry. I could have done without it. The inclusion of this acoustic instrumental baffles me, as it is a poor way to end an album that was supposed to be all-out metal. If I would have placed it anywhere, I would have put it before "Gladiator/The Blade" because the Latin feel of the song fits the theme there.